Microwave technology has become a common tool for chemical synthesis both in academia and industry. Compared to conventional means of synthesis, the advantages of heating with a microwave including Faster reaction times, Improved purity, Greater yields, Better reproducibility & Enhanced reaction control. Flexible - With the ability to perform virtually any type of chemical transformation, from organic to inorganic, materials, and more, the Discover is the most flexible microwave system available. Small scale and large scale, high temperature and low temperature, and gaseous reagents can all be used on a single simple system. Reliable - Built on a robust, proven cavity, the Discover SP is the most reliable microwave system available with little maintenance required. The unique self-tuning cavity automatically adjusts to each sample to maximize microwave power and deliver consistent results. Activent™ vent and reseal technology minimizes over pressurization and helps ensure each reaction goes to completion, every time. Intuitive - Simple software and intuitive programming make the Discover SP the easiest system to operate. Hot keys allow modification of parameters on the fly, onboard data handling stores temperature, power, and pressure profiles, and optional Synergy software generates reports with publication-friendly graphs. Fast - From performing reactions to changing accessories, the Discover SP is built for speed. Quickly change from reflux reaction to sealed vessel conditions to low temperature synthesis. Complete each transformation at the speed of light with greater yields and improved purity. Focused Waveguide The circular design of the waveguide focuses the microwave energy towards the reaction vessel, creating a highly uniform field of microwave energy in the center of the cavity where the reaction vessel rests. This provides consistent heating and the ability to rapidly heat up to temperature. Efficient Cavity Design As the chemical properties of the reaction change, the slits in the cavity wall allow the reaction to draw in more or less microwave energy, ensuring the reaction is optimally energized. This unique design makes efficient use of power and provides safe and controlled heating. Activent® Vent and Reseal Technology Automatically release unexpected pressure quickly and safely using Activent vent and reseal technology, which minimizes vessel failures. At the user’s discretion, the Activent can be programmed to remove gaseous by-products in a controlled manner, allowing the reaction to proceed to completion, or can be programmed to maintain a sealed environment if venting is not desirable. Volume-Independent Temperature Measurement CEM's patented, floor mounted infrared temperature sensor, allows for a wide working volume range requiring only a few vessel sizes. This minimizes laboratory inventory space and consumable costs for the system. Large 300-mL Cavity The large cavity allows the use of standard round bottom flasks and provides full-hand access for routine maintenance, as tools are not required to access the cavity. A spill cup lining the cavity makes cleaning easy, minimizes downtime should a vessel failure occur, and protects the IR temperature sensor. Variable Electromagnetic Stirring Adjustable speed stirring allows proper agitation for each and every reaction. Automation and Flexibility Both the built-in automated pressure device and Explorer automation module streamline the Discover SP, making it simple to use. 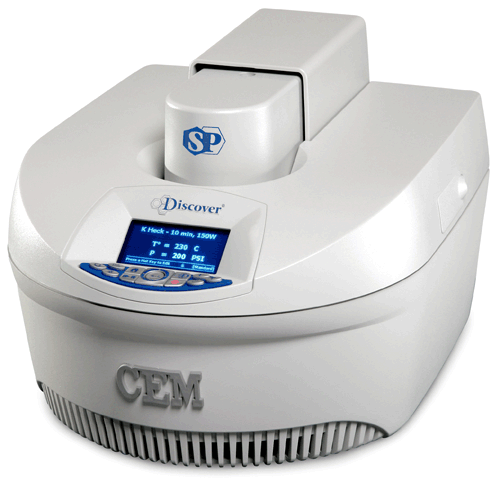 The variety of accessories available yields great flexibility in the research lab, as the Discover SP can accommodate chemistries that require gaseous reagents, allows for syntheses at sub-ambient temperatures, enables continuous flow chemistry, solid phase peptide synthesis, and proteomic sample prep.